Ships Monday, April 22 if ordered in the next 1 day, 19 hours and 41 minutes! 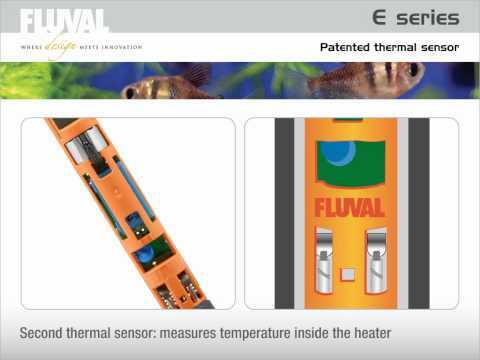 E Series LCD Aquarium Heaters from Fluval are the most advanced submersible aquarium heaters on the market today. 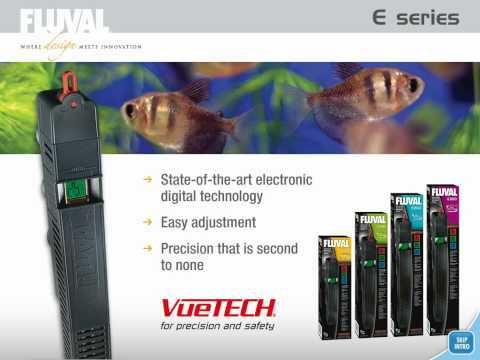 Computer-controlled precision and fish-safe design contributes more than ever to the safety of your tank's inhabitants. Dual temperature sensors, and temperature selection to the nearest 0.5 degree with an LCD display allows for precise control and accurate tank readings. Colored display alert changes color if preset temperature changes plus or minus 2 degrees Fahrenheit. Integrated fish guard keeps fish from direct heater contact and protects glass sleeve from breakage. Easy heater bracket allows heater to be moved or removed without removing it. Designed for tank or sump use.